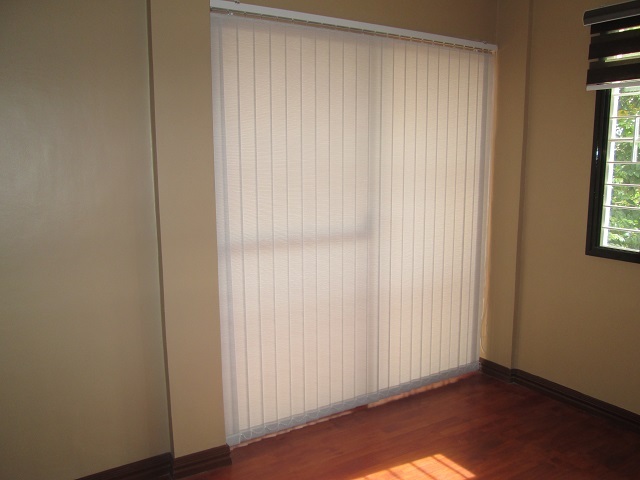 Our feature for today will be the simple yet sophisticated blue fabric vertical blinds installed in one office in Cavite City. 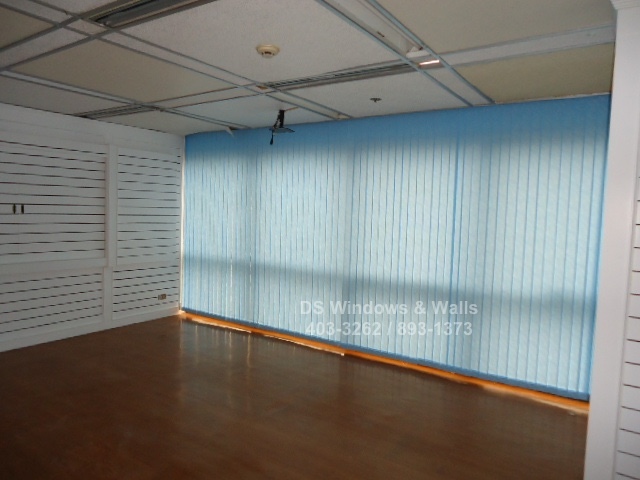 The client evidently opted for the paled turquoise blue vertical blinds to achieve a minimalistic but neat look for the office and to liven up their space. 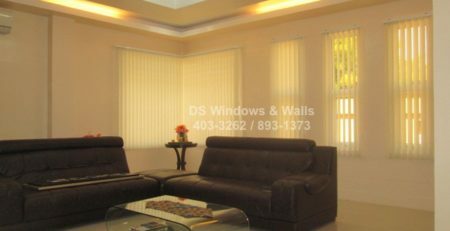 And while these kind of blinds are of various colors and textures, it is also one effective tool in controlling the room’s light intake. One of the eminent factors that affect an employee’s performance is his work environment. He becomes more productive if he is comfortable and if he finds himself functional in his workplace. And this is why designing or fixing a work space is highly required. In today’s industry it is quite clear that the client cares and deeply prioritizes employees’ efficiency and comfort by providing them a tidy and aesthetic-looking office. And since the color blue can create a calming effect on workers, this became the client’s choice to aid his employees’ concentration and focus in their tasks and to vitalize their mental process and productivity. 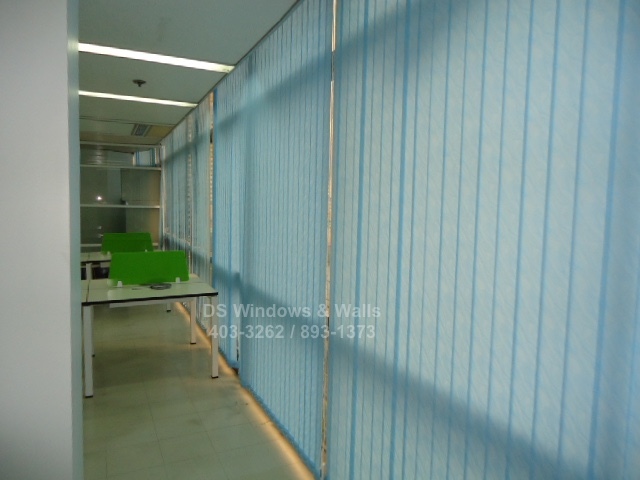 And as seen in one of the areas of this certain office, it can be concluded that the fabric vertical blinds greatly contribute to the light control within the room. 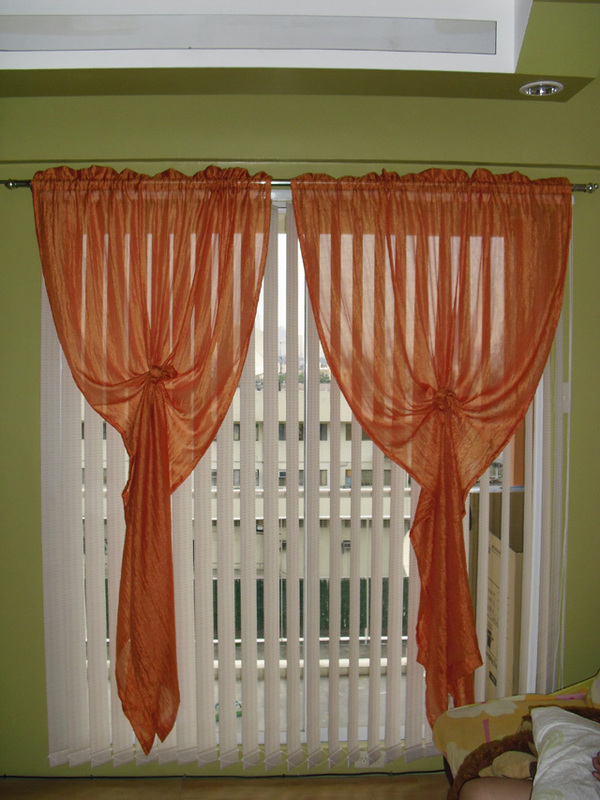 These type of blinds are very convenient to large windows like those in the picture because fabric blinds contain ultraviolet inhibitors that allow light restraint. This comes as an advantage for employees for they will be able to control how much light will they allow inside the office and if their chosen light intake would make them comfortable in their work. Aside from light control, privacy of both company and staff matters or agendas will be secured because of the isolation brought upon by the blinds. Clients would always put products into use convenient to their desired purpose. 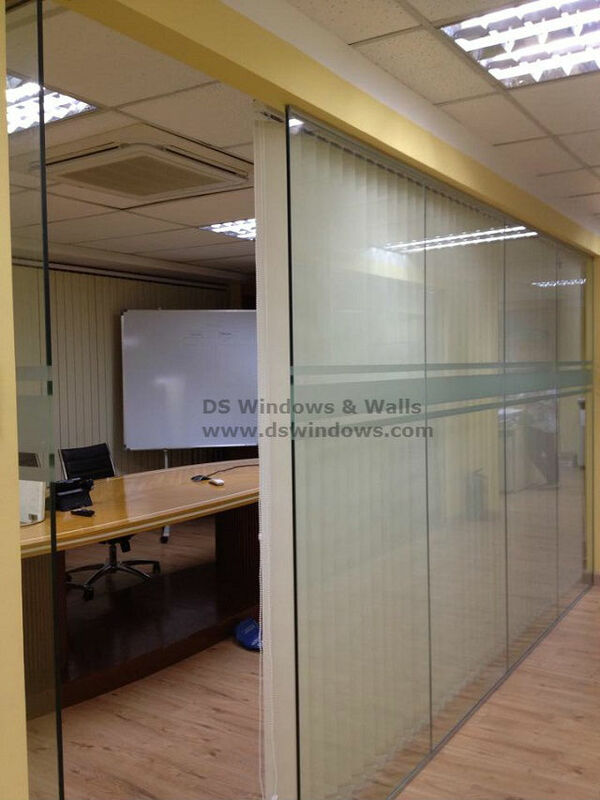 These fabric vertical blinds, for instance, served its purpose as a neat and sophisticated looking cover for the work space that went off well as a minimalistic design for the office. These prove to be very convenient also because it is flexible and long lasting, being able to maintain its unique appearance even after a certain time period. 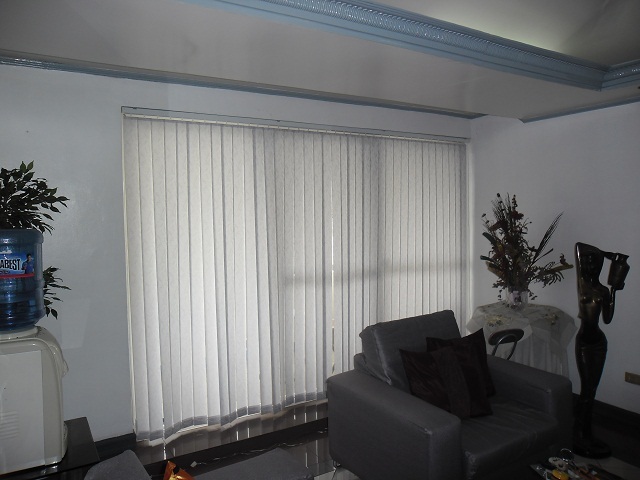 And these type of blinds will go off well with any style given a client’s creativity and with the aid of professional installers that our company also offer as a part of our service. 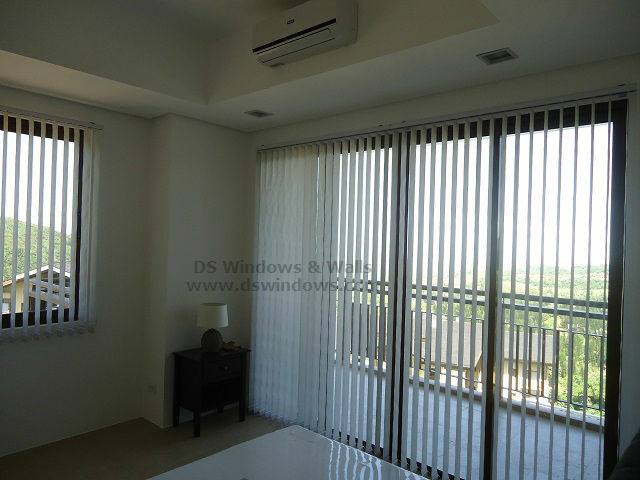 For more information on our fabric vertical blinds (as well as for other types of blinds), please do not hesitate to call us at (02) 403-3262, (02) 893-1373, (02) 668-9668, 0916-311-3909 or email us at inquiry@dswindows.com. To see our samples you may also visit us at our mall branches. For Cavite, Batangas, Laguna area you may also call Patrick Villapando at (Globe) 0917-583-0214 or (Sun) 0922-592-6111 or (Smart) 0908-989-4676.